Wheatley was a total exception to the norm in a day and age when black servants had few or no rights. Poems on Various Subjects (1773), financed by her mistress, was the first ever volume of poems published by an African-American person in the U.S. and the third American woman ever. In the preface, seventeen Boston men had to certify that she was indeed the author, such was the credibility of a black woman in 18th century America. After some travelling to London following her success, Phillis returned to the U.S. and married a free black man, but all their three children died in infancy. Her protectors, Mr and Mrs Wheatley, passed away too and she was forced to return to work as a maid in a boarding house. She continued writing but she found no publishers for her second book. She died of illness as a young woman of only 31 after a tumultuous life of ups and downs, but left a strong legacy for changing racial attitudes in a Revolutionary era. 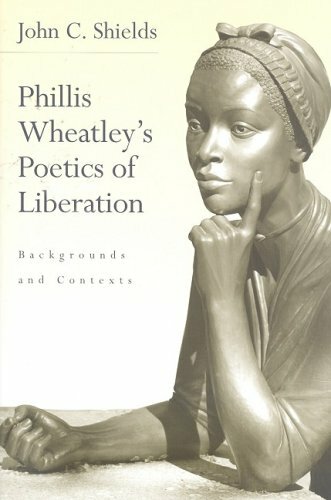 In Wheatley’s Poetics of Liberation: Backgrounds and Contexts (2008), John C. Shields demonstrated that although she was probably not the greatest poet, her originality came from a relatively short period of assimilation of various intellectual traditions, turning these into a unique vision. Shields identified three stages in her progress: her youth poetry, while she strived for white acceptance, a more mature phase, where by not finding publishers there was an inward turn to contemplation and self-study i.e. poems such as On Imagination (1773); and, after her manumission (or freeing from slavery), a more confident, public and aggressive stance. 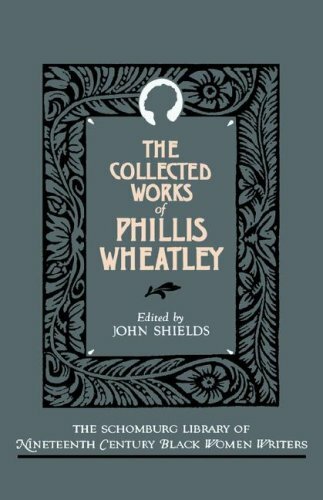 Perhaps the most interesting aspect in Wheatley’s writing is the parallel of her liberation from slavery and the release of her imagination or inner freedom. At the same time, there is a distinctive sense of agency or her realisation of having some power over her own destiny. In Phillis Wheatley and the Romantics (2010), Shields compared the romanticism of the poem On Imagination to John Keats’s Ode to a Nightingale (1819) in the sense that in both imagination helps recreate an idyllic mythical world, but which provides only temporary escape from reality. In Wheatley’s case, more than any other white free male poet’s case, the romantic similes acquire stronger visual connotations: fetters become real chains or shackles and the role of imagination can be seen quite literally as liberator from captivity. Never knew anything about this. A shame so many great minds never got their chance, but this should be an inspiring lesson to us all. I really wish this woman’s story could be taught at school, especially since I was schooled in a part of Africa populated by descendants of slaves. Thank you for sharing this story. Fascinating post – thank you! Thank you for this post, such an interesting history. It amazes me always where you find such amazing information.